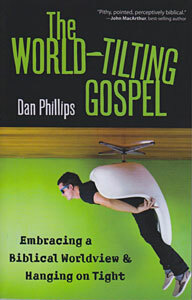 I have been reading these past few days Dan Phillip’s book, The World-Tilting Gospel, and I have certainly enjoyed it very much. This is a book that I recommend to anyone who professes to be a Christian but cannot explain the basics of his faith: what is the Gospel for example, and what does it mean -and why it matters so much- to have a Biblical worldview. On the other hand, it is a book that I recommend to those who already know the answers to those questions, but love the Gospel so much that reading about the wonderful truths in it is always a joy, a refreshment. It is like taking the time to sit back on a lovely day and be reminded of all its beauty, and once more, fall in love with it. Yesterday I read what Phillips writes about repentance; and it made me think about the beauty of it. O what a wonderful gift it is to us! Yet, just like we do with many other of the gifts we receive from God, at times we despise it. How many times have we used this word only as an excuse to hide the sin we love? We say “I repent, forgive me,” only to keep on doing exactly the same thing, over and over again; making no effort to kill that sin; making no attempt to mortify the sin that wants to rule our conduct and destroy our relationships. “Maybe a better explanation of repentance would be a transformed mind, or a transformed way of thinking that issues in a transformed life. “Everything is transformed,” this just hits hard. If we are still in this body, we are still struggling with our sinful nature, that is true. But, if we are true believers, repentance should be part of our daily walk with the Lord, which in turns means that we should be transformed every day in all things, in our attitudes, in the way we see things, in the way we look at the world. Always walking forward toward the goal: our sanctification. Change and transformation must be part of our daily life. I don’t want to be the same person that I am today in ten years, or two months, or three weeks from now; not even when I go to bed tonight. And this truth not only refers to the first time we are called out of darkness into His admirable light. This is true for today, in our Christian walk. Today I cannot turn to God without turning away from sin. Today as we look at the Cross and take time to examine our heart, I pray we will truly grasp by the Spirit of God, what true repentance means so that, in turn, we may be changed into his likeness. If you are interested, you can read a more thorough review of this book at Douglas Wilson’s Blog. This entry was posted in Books, Borrowed_Words, Sanctification by Becky Pliego. Bookmark the permalink. Thanks for posting what you are reading.